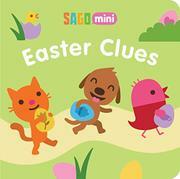 The Sago characters go on an Easter hunt. Jinja the cat is out walking the trails when she finds a note: “Follow the clues to find an Easter surprise!” it says. And so Jinja does, and so do little readers. By tracing their fingers along the faint path, little ones will discover clues, meet other Sago characters, and eventually wind up at Jack’s treehouse for a tea party. Why Jack is hosting a tea party and leaving Easter clues along the way is never explained, but Sago’s got to get in on the holiday action somehow. Those familiar with the brand and used to poking their fingers at the app’s characters will feel right at home here, but others will be less amused. The muted neon critters blend into spring scenes better than the winter ones found in Cozy Christmas (2016), but the illustrations still feel perfunctory.